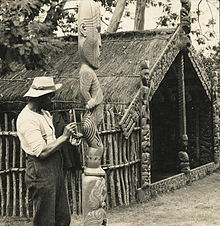 A Māori man working on a carved wooden tiki in New Zealand, 1905. A tiki is a carved wooden or stone object depicting a human-like figure. They are found in Polynesian cultures in the Pacific Islands. The carvings often serve to mark the boundaries of sacred sites. The term is also used in Māori mythology, where Tiki is the first man.